The award sculpture, created by internationally acclaimed Bahamian sculptor Antonius Roberts, ranks among the most beautiful and valuable web awards in the world. Henry Knowles, webmaster of the Queen's College website, walked away with the Best of the Bahamas Award, the top award at the Third Annual Bahamas Web Awards ceremony. The luncheon event, emceed by the queen of Bahamian entertainment, T'Rez Hepburn, was held on December 8, at the British Colonial Hilton hotel in Nassau, Bahamas. 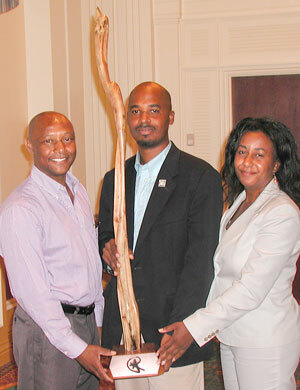 The Best of The Bahamas Award is a prized sculpture, created exclusively for the Bahamas Web Awards each year, by sculptor Antonius Roberts from The Bahamas. This year, the presentation of the award was given a special honour as it was presented by Erica James, the distinguished curator of the National Art Gallery of The Bahamas. Antonius Roberts - sculptor and creator of the exclusive Best of The Bahamas Award sculpture, the top honour in The Bahamas Web Awards. Henry Knowles - Webmaster for the Queen's College Website, winner of the 2005 Best of The Bahamas Award. Erica James - Curator of the National Art Gallery of The Bahamas and Presenter of the 2005 Best of The Bahamas Award. The Bahamas Web Awards is judged by a panel of expert judges who vote on the basis of strategic and creative criteria including; content, visual design, functionality, innovation and whether the site has achieved its objectives. This year's judges included: Mr. Roberts, Colin Higgs, Permanent Secretary at the Bahamas Ministry of Tourism; Brian Nutt, President of the Bahamas Employers Confederation (BECON) and winner of the 2004 Internet Hall of Fame Award; and Dr. Adrian Scott Ph.D., Internet entrepreneur, co-founder of Napster and founder of Ryze Ltd. The Queen's College website also received the Judge's Selection Award for the best website in the Education category. Judge's Selection Awards are presented to the top scoring website in each of the seven categories. The HG Christie website was the previous winner of the 2003 Best of The Bahamas Award. This year, the award winning real estate site was the second highest scoring site in the entire contest, ranking only 4 points (out of a possible 200 points) below the winning Queen's College site. In addition to the Judge's Selection Category Award, the Smith & Benjamin website also won the top hounour in the People's Choice contest, having garnered the most votes from the general public. The husband and wife team won the most awards at this year's ceremony (3) by also winning the People's Choice Award for best website in the Art, Music & Culture category. And if talent isn't enough, this dynamic duo must also have good luck, seeing as they walked away with two door prizes as well. Sponsored by Bahamas B2B, Coralwave, Custom Computers, Benelda.com Web Design and QuenCom Audio-Visual, the Bahamas Web Awards is the leading national honour for the best among Bahamian websites.